Hi, I'm just wondering how everyone is proofing they're fonts when you have multiple styles, I'm looking for something that basically does what Autopsy does (at the minimum just put every master next to each other for each glyph), but I can't find an easy way to do that in Glyphs App...? And I can't get FontInspector to work anymore either. Do you mean multiple master styles? 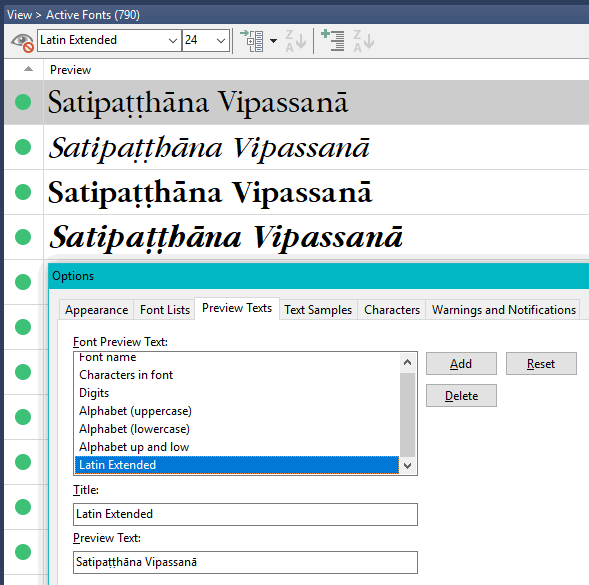 One solution is to use a font manager like MainType. I defined a layout to make proofing multiple styles easier. Just type the text string that you want to compare across the four (or more) styles. I maximised the width of the preview column and increased the font size to 36 point. One can add user-defined preview text strings. Just to make sure you're aware, in the preview pane at the bottom of the Glyphs window, you can set the first dropdown to Show All Instances of the current glyph. And in the main edit menu you can use a mekkablue script to show all masters. In both cases this is just one glyph at a time so doesn't solve all your needs but just FYI.